Certify is well suited for businesses that have a lot of employees that travel. Our business is global so there are many employees traveling from country to country to get work done. All their expenses would be hard to keep track of if we did not have Certify. It is less appropriate to have Certify if only a few employees use the company card and if the company does not do a lot of traveling. Certify helps organize all business transactions made from employees. Certify helps keep a paper trail of every expense made on a company card. Certify is easy to organize all expenses made for a user. Certify helps employees keep track of all their spending. Sometimes when downloading into accounting software the classes are input incorrectly. I'm not sure that this is a Certify problem or an accounting software issue. Very easy to use never had any issues where an employee was unable to complete an expense report. I always get an English speaking person very quickly on the phone. It has made our organization more efficient. It has improved communication within the organization regarding expenses and approval from managers. 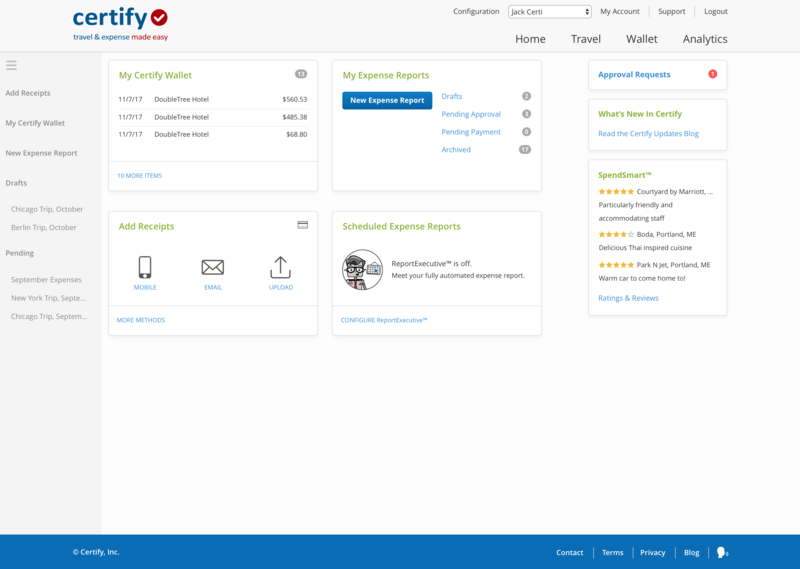 Certify Homepage - User interface for all users that includes a quick view of their expenses, pending expense reports and approval requests.